As some of you may have noticed, a little movie called ‘Hunger Games’ was released on March 23rd to some staggering ticket sales (152+ Million). But is it for you? The movie ‘Hunger Games’ is based on the book ‘Hunger Games’ written by Suzanne Collins, and the screenplay for the film was written by Collins and the movie’s director Gary Ross (writer, director, producer). The movies main character is Catniss Everdeen (played by Jennifer Lawrence). The acting is executed brilliantly, and I would just like to thank Hollywood for their recent practice of not putting the same young, hot, actress in every movie that comes out! The new talent on screen in ‘Hunger Games’, really helps you get lost in the movie, and this also gives other actors a chance to shine. There are some seasoned acting veterans making smaller appearances , and I really enjoyed seeing Woody Harrelson, Stanly Tucci, Lenny Kravitz and Donald Sutherland again. The movie takes place in a very altered, post-apocalyptic future society, where the people in charge (some governing board) has divided people into districts. While there is one wealthy district, there are 11 poorer districts. As punishment for previous rebellion, the Hunger Games were invented by the Capitol as punishment in which 24 young people are placed in a setting with certain provisions, and are forced to kill or be killed. The last one standing is the winner. When children reach the age of 12, their name is placed in a lottery, which is used during the “reaping” ceremony once a year ,in which two names are pulled for each district. One boy and one girl is selected at random to participate in the Hunger Games and to represent their district. Those chosen are called “tributes”, and will be escorted to a facility for preparation so they can fight to the death against other “tributes” selected from other districts. Catniss Everdeen is from district 12, and is just trying to keep her and her family fed by hunting small game. When Catniss’ younger sister is picked during a “reaping” ceremony, Catniss volunteers to take her place. While Catniss has no problem surviving against nature, she learns a lot on how to survive against people. Catniss learns how to improve the things she is weak at, play to her strengths, and stay true to herself in the process. There are numerous underlying messages and lessons that relate to the world we live in now, but I couldn’t help but think I am grateful I will not live long enough to experience the (possible)fashions of the future. While the sets, wardrobe, and sound are all superior, I only had a problem with a few scenes that were shot with shaky camera moves. In recent years, directors have chosen to use these shots to help the audience feel they are in the action, and promote feelings of confusion or a frenzied, nervous, edge-of-your-seat energy. The book ‘Hunger Games’ is actually the first in a three book series, and I enjoyed the movie so much, I think I will give the book a try, as they are usually better than the movie. The next books, which(I believe) will also be made into movies are: ‘Catching Fire’ and ‘Mocking Jay’. I can’t help but notice, or mention, that some books have made excellent movies (The Harry Potter Trilogy, The Twilight series). While bookstores may be on the endangered species list, it’s very obvious we still need novels. 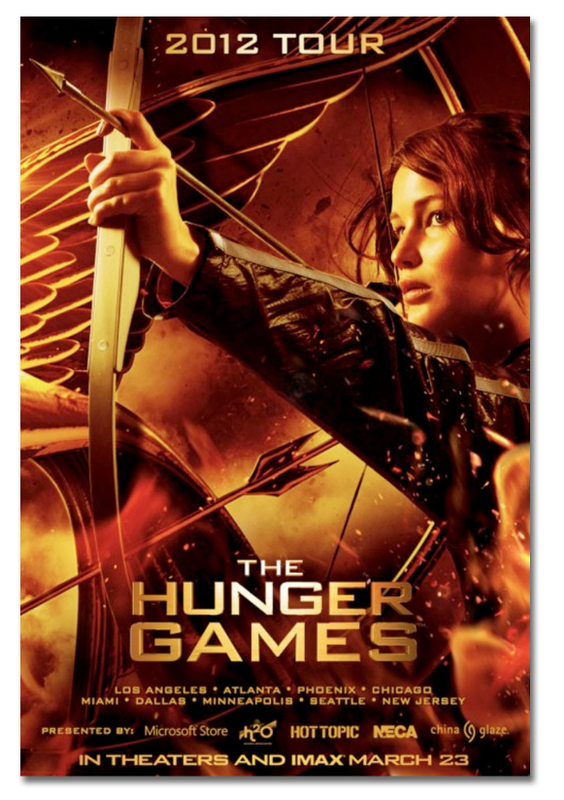 If you like action, drama and suspense, you will like ‘The Hunger Games’. One of the movie’s messages I got: if you don’t like the rules of the game, maybe you can find a way to get “them” to change the rules.